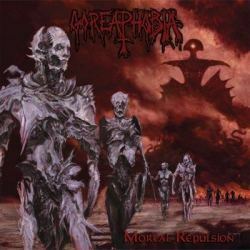 Mortal Repulsion is the first longplayer by Goreaphobia, an American death metal band that is anything but a newcomer. Starting in the late Eighties, they built themselves quite a reputation in the early Nineties with only a demo tape an a vinyl single to back them up. Although they played all over the USA with every important death metal band of that era, it was not yet meant to be their time. In the following years, vocalist and bass player Chris Gamble became a live member of Texan black metal legend Absu, but wants to have a second chance at his own band. Teaming up with guitarist John McEntee and drummer Jim Roe, both of Incantation fame, the reformed Goreaphobia finally found the time to lock themselves up in a studio and record their first regular album. In the twenty years that passed since Goreaphobia’s early days, a lot has happened in the death metal genre, making you certainly ask if this band is still relevant today. As a matter of fact, they definitely are! Already the opener Ordeal Of The Abyss surprises with wonderful old school death metal, the way it sounded in its pioneering times. Back then, the genre was not about setting new records in brutality and aggression, but in establishing a musical movement that was taking thrash metal to the next level. The guitar riffs are containing more hooks than we get nowadays, the vocals are gritty yet understandable, there is a certain amount of melody that can be discerned in every track, and best of all, not everything sounds the same. More than a stylistic exercise, Mortal Repulsion is a splendid death metal album that is spitefully oblivious of every current trend and fashion hype. The guitar solos are inserted fitfully into the songs, there is a variety of short, fast songs and a couple of longer pieces that show a certain Hellhammer influence. The title track comes last, after the epic eight minute long The Inevitable Punishment / Faded Into Ends (Part 2), thus bringing a really good album to a satisfying conclusion. One might argue that Goreaphobia are not really relevant anymore, because what they play has been done by countless other bands already two decades ago. By taking care never to neglect their songwriting, the three-piece makes sure that Mortal Repulsion stands out as a timeless piece of old school death metal that everyone who was there since the beginning will most likely prefer over all the younger bands that followed.